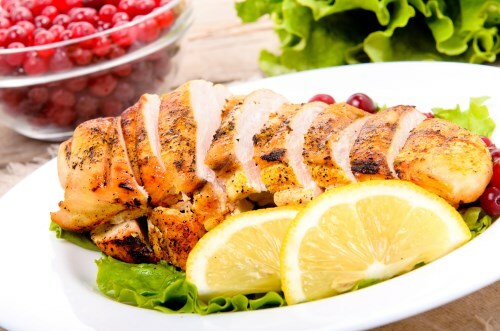 Loosen the skin from the meat of the turkey breast. Place the turkey breast into a large oven-safe pot or Dutch oven with a lid and pour chicken stock over the meat. Mix melted butter with chicken bouillon granules, sage, savory, rosemary, and thyme in a bowl. Lift the loosened skin and pour slightly more than half the butter-herb mixture under the skin. Pour remaining herb mixture over the skin. Cover the pot. Roast in the preheated oven for 3 hours; flip turkey breast over and roast 1 more hour; flip again and roast until the juices run clear and an instant-read meat thermometer inserted into the thickest part of the breast, not touching bone, reads 180 degrees F (80 degrees C), 1 additional hour (5 hours in all). Baste turkey with pan drippings and let stand 5 to 10 minutes before serving.